Guests are welcome to arrive from 9:00am and store their luggage and use on-site facilities until their room(s) or bed(s) are ready for checking in. Our reception office is open from 9:00am to 9:00pm. Checking is after 9pm is not possible, so make sure to arrange your transportation to Cesky Krumlov to arrive during business hours. We take only cash, in Czech Crowns, as payment. Until 48 hours prior to arrival we accept your cancellation without any charge. For later cancellations and 'no shows' we'll charge one night on your credit card. Once the 14th century St Elizabeth's Hospital, Hostel 99 has for almost 20 years been the most comfortable, friendly and fun place to stop for a few days (or weeks) in Cesky Krumlov. Hostel 99 is located just within the medieval walls of this UNESCO World Heritage town, one of the worlds best preserved medieval cities. 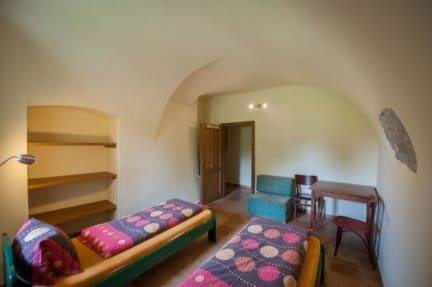 Explore the town and get lost in the medieval streets and alleyways, then come home to Hostel 99, the perfect place to meet fellow travelers, cook a meal in the fully equipped kitchen and listen to your favorite music. Play table tennis and enjoy a beer on our sun-terrace with the castle tower as your backdrop. Watch TV from our ever-growing collection of movies and DVDs. Kick back and relax. For the more adventurous, ask us to show you where to rent a bike, canoe, raft or horse ride for even more action. With artwork hanging all over the place, you're bound to have a colorful stay! The attic dorms are full of character. Choose from one of our 3 dorms (from 8 to 12 beds) - with absolutely no bunk beds! Or choose a comfortable double or twin private suite. Have breakfast in our Deli 99 cafe! Great sandwiches, baguettes, croissants and more... Savor delicious Illy coffee while viewing pictures from locals' travels. The Restaurant 99 and bar offer some of the best Czech and American-inspired dishes in town. Join the locals or guests on the lovely terrace or inside by the fireplace, while enjoying a drink and good food at reasonable prices. We can also help to arrange a rafting trip or shuttle transport. Ask the front desk guys for help. We know from the last 14 years' of experience that once you stay at Hostel 99, you'll find it hard to leave!